Volcanic Island Hopping - We travel between the islands by ferry, and take a boat tour out to Los Organos basalt columns on La Gomera. The Vulcanologist's Dream - we take the ferry to the Westman Islands for the day to learn about the recent eruptions on Heimaey. The Classic Volcanoes - We travel to and between the Aeolian Islands by public ferry and hydrofoil. We also take a boat tour to Stromboli, where the eruptions can be optionally seen from the volcano or the boat. All our trips to Antarctica, Falklands, South Georgia, Greenland and Svalbard are ship based with excursions to and from the ship via zodiac inflatable boats. 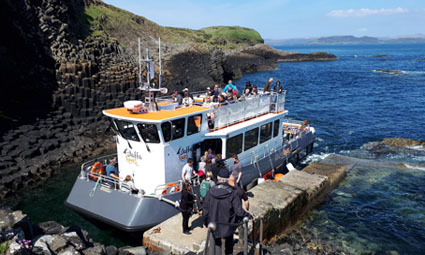 The Birth of Geology - This tour has 3 boat trips, one all day trip to Fingal's Cave, another had day trip to Loch Coruisk on the Isle of Skye and a short dingy in Smoo Cave. Atlantic Odyssey - All of these mid Atlantic islands are visited by ship, with small boat zodiac excursions to get ashore. An all day boat tour to Fingal's Cave in Scotland.